As great as the different versions of Google Android may be, they’re still not the best at providing you with a real file manager the way that you would organize files on a more conventional computer. Thankfully, there is an abundance of apps available through the Google Play Store that serve this purpose and one such example is File Expert by Geek Software Technology. It’s not meant to be the flashiest-looking app out there, but it is meant to provide you with the file access that you desire through a user interface that is clean, simple, and easy to understand. Best of all, the file management even extends beyond your mobile device and into the wireless waves. It’s all in monochrome, giving the app an almost retro Mac-like appeal. Single taps open up any of these different categories, and then you can drill down through your different media and files the same way you would on your home computer. The file structure is hierarchical, just like on a Windows PC, so you can drill your way through folders and sub-folders in a reasonably simple way. Most Android devices use the internal memory for file storage, but many also offer an SD or MicroSD card slot as well. If you have such a memory card inserted in your device, File Expert can access files and media stored on your memory card too. For the most part, you are offered thumbnails for the image files, but this does not always appear to be the case. Sometimes, I found that the files were simply displayed by their file names. As you can imagine, this can be confusing when the files are just a date and time, especially if you took several photos in succession. 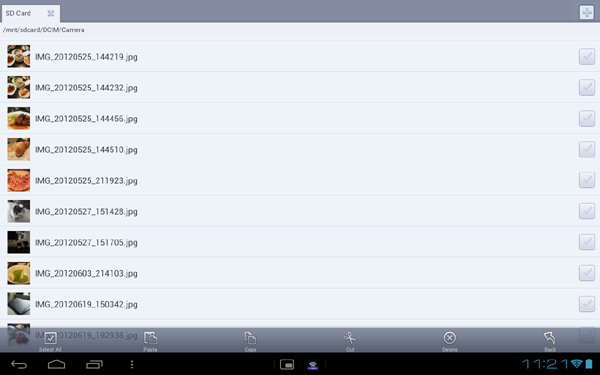 Here is a look at the “camera” folder on my Android tablet, for example. If it were not for the thumbnails, I’d have a really hard time remembering what each file was. As you can see along the bottom, you are provided with a series of tools and functions. You can select all, copy, cut, paste, and delete. There are checkboxes next to each of the files too. You see, the interesting thing isn’t that you highlight a file and then choose where you want to move it; instead, you cut (or copy) the file to the clipboard, navigate to the destination folder, and then “paste” the file. The result is the same, but it’s not quite as seamless as the drag-and-drop or dual-pane functionality that you may find in some other apps. You can rename your files through this utility too. The app offers far more than just local storage. More and more, we’re going to the cloud to stash our files, so you need an easy way to access those files. You could open up the dedicated Dropbox app to get at your Dropbox files, and then another app for SkyDrive and other cloud storage, but that’s clunky. File Expert amalgamates all that content into one place. 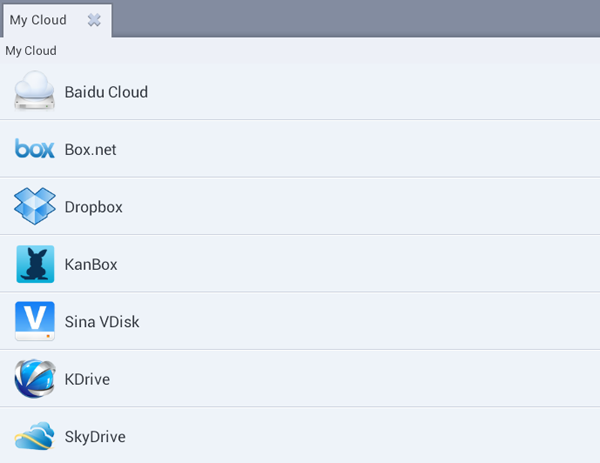 File Expert supports a number of cloud-based storage solutions, like SkyDrive and Dropbox mentioned above, as well as Box.net, KDrive, and Baidu Cloud. You simply link up your account from these services to File Expert, and they will appear as just another folder in the file manager. You can rename, copy, paste, and delete just as you would as if the files were stored locally. In addition, File Expert has FTP/HTTP server support, letting you pull files from your remote server. There’s also support for SMB, WebDAV, and Bluetooth transfers via OBEX, as well as NFC support for wireless transfers between compatible devices. Despite the relatively simple appearance of File Expert, there’s actually a lot that can be done here. You would think that with a name like File Expert, the app would focus entirely on expertly managing your files. While that is certainly the primary objective of the app, there is an additional function that lets you manage your apps too. Yes, Android already has a built-in utility where you can update and uninstall apps as you see fit (aside from the pre-installed apps that can’t be deleted), but File Expert can be used for uninstalling apps too. That’s not too useful, per se, but you will find that the ability to backup your apps can be useful in some circumstances. Again, you have the ability to use the checkboxes to mark off multiple items at once, so you can backup several apps at the same time. Considering the clean and simple layout of File Expert, I wouldn’t really care too much about throwing on a different theme myself. That said, the people at Geek Software Technology thought that some people might, so they have a series of official theme add-ons like ClassicBlack and Ghost Black. They don’t add anything to the functionality, but they do change the look of the app. 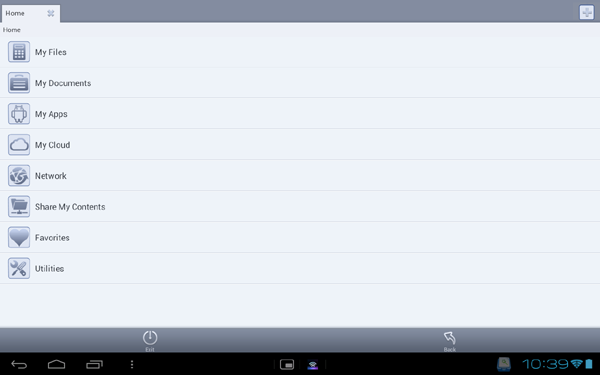 It’s a minor detail, but it is one that sets this file manager apart from similar offerings for Android. To be honest, File Expert is far from being a groundbreaking app in what it offers. What it really does is fill in a gap that should have already been filled by a native app from Google itself. You can copy, rename and delete files with ease, including files that you have stored in the cloud or on a remote server. That’s handy. The support for Bluetooth, NFC, and Wi-Fi “local” transfers can come in handy in a pinch too. There are many different file manager apps available for Android, and most of them are quite similar to File Expert, but this one gets the job done and it’s a free download from the Google Play Store. If you need some basic file operations in a clean interface, File Expert isn’t a bad choice at all.